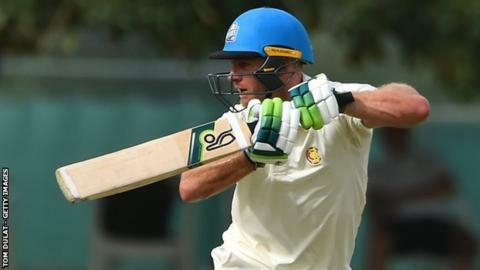 Worcestershire captain Ben Cox became their third centurion of the game at Grace Road, hitting an unbeaten 100 to help his side declare on 553-6. Resuming on 348-4, Hamish Rutherford added only seven to his overnight score before being caught behind for 123. But he was one of only two further wickets to fall as Cox, who faced 134 balls, Ross Whiteley (49) and Ed Barnard (53 not out) boosted the total. Leicestershire then recovered from 24-2 to reach the close on 180-4. Mark Cosgrove made 67 and opener Ateeq Javid was still there on 55, having so far lasted three hours and 20 minutes and collected eight boundaries from his 154 deliveries. But the Foxes still need a further 224 runs to avoid following on. Cox's century, in his new role deputising for the injured Joe Leach, followed Daryl Mitchell and Rutherford in reaching three figures the previous day. That made it the first time Worcestershire have had three centurions in the same innings for 12 years. The last time they performed the feat was at New Road against Surrey in June 2007 - when the top three of Vikram Solanki (232), Stephen Moore (143) and Phil Jaques (124) helped them amass 701-6 declared, the highest score in the county's 120-year history. "It was nice to spend time in the middle, I hadn't got any runs in pre-season. We weren't going to mess around on a pretty slow wicket. "We had to make sure the game was moving forward and that's what we did. I wasn't nervous in the 90s, I just didn't want to force it and start playing across the line. "The pitch was showing increasing signs of the ball going down. It's one of those we're going to have to work hard on for our wickets, so if you'd said at tea we'd have four by the close, I'd have taken it." "Ateeq Javid got stuck in and stuck to his plans while Mark Cosgrove counter-attacked, but when you've fielded for 140 overs there's always going to be an element of fatigue. "Perhaps there were some tired minds out there. It would have been nice to have been two down rather than four, but that's the game. "They had three centurions, and we need our batters to stand up. We bat down to eleven and we need to set our stall out to bat all day."